On 30 August 2011 Ellie Mansour pleaded guilty to one charge of selling unsuitable food, contrary to the Food Act 1984 s 12(2). The Magistrates' Court sitting at Melbourne imposed on Mr Mansour an adjourned undertaking without conviction, in accordance with Sentencing Act 1991 s 75, with a special condition that he pay $2500 to St Vincent de Paul's food van service. The City of Melbourne, which employed the informant, sought judicial review of the sentence to the Supreme Court on two points. First, could the Magistrates' Court imposed a special condition that Mr Mansour make a payment to St Vincent de Paul? Second, should any penalty ordered have been made payable to the City of Melbourne? You might wonder at this stage why on earth this review was launched? Like many cases, it was about money. Specifically, about where money paid by an offender should go. In Brittain v Mansour  VSC 50 the City of Melbourne argued — successfully, as it turned out — that any money to be paid by an offender under a Food Act prosecution must be paid to the City of Melbourne, and not to a third party. (1) A court, on being satisfied that a person is guilty of an offence, may (without recording a conviction) adjourn the proceeding for a period of up to 60 months and release the offender on the offender giving an undertaking with conditions attached. 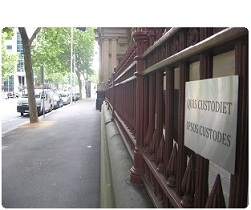 (c) that the offender observes any special conditions imposed by the court. (3) Subject to Division 2 of Part 3BA, a court may attach a justice plan condition that the offender participate in the services specified in a justice plan for a period of up to 2 years specified by the court or the period of the adjournment, whichever is the shorter. (b) by notice issued by the proper officer of the court. (5) An order or notice under subsection (4) must be served on the offender not less than 4 days before the time specified in it for the attendance. (6) If at the time to which the further hearing of a proceeding is adjourned the court is satisfied that the offender has observed the conditions of the undertaking, it must dismiss the charge without any further hearing of the proceeding. At , Dixon J noted that special condition is not defined in the Sentencing Act, and the provision neither precludes or authorises a financial payment in favour of a third party. includes any penalties, forfeitures, sums of money and costs ordered to be paid by the person fined. At , the Court referred to Sentencing Act s 59, which provided that any fine must be paid into consolidated revenue if no other way of appropriating or applying it was prescribed in law. Section 59 was repealed by the Courts and Sentencing Legislation Amendment Act 2012 s 44 with effect from 16 July 2012, and re-enacted (according to the ex-mem) as Sentencing Act s 66C on the same day by s 53 of that amending act. (1) Where an offence against this Act has been prosecuted by the council, all penalties recovered in relation to the offence shall be paid into the municipal fund of that council. (2) If an infringement notice has been issued by a council under this Act, the infringement penalty recovered in relation to the notice is payable to the municipal fund of the council. (b) an infringement notice issued by an authorized officer of a council is taken to have been issued by the council. Is a special condition to pay money a 'fine'? At  ff, Dixon J considered the arguments by the parties (with PILCH appearing as a friend of the court, or amicus curiae), before ultimately concluding that an order to pay money, other than compensation or restitution, as part of an adjourned undertaking is indeed a 'fine'. 50 Bearing these considerations in mind, special conditions imposed in an undertaking on an offender being released under s 75 must be consistent with the purposes of making an order under Part 3B Division 2. I have set out above the provisions of s 70 which states these purposes. The condition that the offender pay $2,500 to St Vincent de Paul is not directed to achieving any of the five purposes that are there set out. It was not contended that the payment required was nominal and it is a payment that appears to be within the range that would be considered for a fine. The sentencing purposes dictated by s 70 of the Act for adjournments as sentences would not ordinarily permit the imposition of a monetary payment as a special condition, because it will be, in substance, the imposition of a fine, a punishment that is not nominal or a display of mercy. As I have said, a purpose of the special condition was as a penalty or punishment. The limitations on the power to impose special conditions in undertakings are found in s 70 of the Act and, in this instance, those limitations have been exceeded. 51 A fine may be imposed without a conviction being recorded. A sentencing court’s decision that a punishment is appropriate that imposes some financial consequence, but without the consequences of a conviction, can be achieved. That appears to be the intention in this case. Once the sentencing court determines that imposing some financial consequence is an appropriate purpose for the sentence, that purpose cannot be achieved by a dismissal, discharge, or adjournment. The requirement for a monetary payment as a special condition effectively imposes a fine or a form of monetary impost of a kind that the Act requires to be imposed as a fine. Applying s 5(7), the court must impose a fine in accordance with Part 3B Division 1 of the Act. 52 A money payment for a charitable purpose, and, specifically, a financial contribution to the court fund are not identified in the section, or elsewhere in the Act, as purposes for which an order may be made under the sub-division. Payments of that type, unlike payments in restitution or of compensation, are not excluded from the definition of a fine. The legislature has not seen fit to empower a sentencing court, where it is a Magistrates’ Court, to impose obligations to make monetary payments under a special condition in an undertaking to provide funds for the Magistrates’ Court’s court fund or such community based charities as a magistrate may wish to support. The legislature could have achieved that objective by extending the excluded purposes for monetary payments from the definition of a fine, beyond restitution or compensation, to make clear that such payments are not fines. It has not done so. The language of the statute makes clear the legislative intention. The twittersphere has been a-tweet with discussion of this case since it was delivered yesterday, and it made the mainstream news earlier today, such as this article in The Age; this article in the Herald-Sun; and this one in The Australian. Dixon J was well aware of the possible consequences, but also pointed out where the remedy lies: Parliament. 26 I have evidence from Mr Brittain of three occasions in 2010 when offenders found guilty of breaches of the Food Act made payments to charitable organisations totalling $70,000. I have evidence from Mr Brittain of eight occasions between 2007 and 2011 of payments totalling $339,500 imposed by different magistrates for statutory offences. Information provided from the Lighthouse Foundation suggests that between August 2011 and June 2012, it received $6,500 from the court fund and $17,800 from ‘court directed’ payments. This evidence, which is not based on a proper statistical sample or a survey, does not reveal the frequency with which special conditions requiring a payment to the court fund or a charity are imposed on offenders or the total sums that may be involved. 27 The printed form used by magistrates to acknowledge an undertaking includes a box that can be ticked and a clause that can be completed to provide for such a condition. I suspect that many hundreds of thousands, possibly millions, of dollars are contributed annually to the court fund and charities by offenders released on adjournment without conviction. I believe dispositions of summary offences in this manner are a common practice of long standing. The court fund is distributed to not-for-profit organisations that provide charitable or community services for the benefit of Victorians in need or at a disadvantage within local communities. It is often the case that a charity expressly nominated by a magistrate to receive the payment provides relief from the disadvantages that flow from the offending conduct. As will become apparent, negative and possibly unintended consequences, for beneficiaries of the court fund and charities, may follow if the construction of the Sentencing Act contended for by Mr Brittain is correct. 56 Having regard to the history and significance of the court fund and the support provided by local courts to their communities, it may be that the absence of power to impose on an offender a monetary payment obligation to a charity as a condition of release on adjournment to be of good behaviour is an unintended consequence of reforms to sentencing, but that is a matter for others. I think most advocates will agree that some form of payment to a charity is — or was — a routine special condition imposed as part of adjourned undertaking. This case will undoubtedly affect many charities that benefitted from those payments. It seems any payments imposed as part of an undertaking will now have to go into consolidated revenue, unless legislation directs it to some particular place or prosecuting authority. And really, those payments will have to be characterised as fines, otherwise the order will be in jeopardy of being declared ultra vires. Of course, it will still be possible to impose undertakings with other special conditions — except perhaps for corporate offenders, that can't really do anything other than pay money, given their ethereal nature — but I think we will see a reduction in undertakings as sentence outcomes for the immediate future. 'Good morning', or no 'good morning'? Help, in the name of the law!